The project has study sites along the path of Typhoon Yolanda. These are found in four provinces: Palompon in Leyte; Bantayan Island in Cebu; Kalibo in Aklan; and Busuanga in Palawan. Control sites were also established in Subic and Masinloc in Zambales, and Bani in Pangasinan. Different criteria such as extent of the forest, species composition, and reported damages were considered in choosing sites. In each site, five meter-radius plots were randomly established and assessed based on species richness, seedling density, incurred damages, and signs of regeneration. Damages observed were categorized as: snapped, defoliated, and uprooted. The signs of regeneration observed were categorized into two: refoliation and seedling recruitment. The site with the highest number of seedlings is the natural mangrove stand in Kalibo, while the site with the lowest number is the mainland and island sites in Palompon (Fig. 1). Fig. 1. Seedling density across all sites, with Kalibo natural mangrove stands having the most seedlings and Palompon sites with the least seedling density. Damaged trees are the snapped, defoliated, or uprooted trees. Regenerated trees are those that have refoliated or coppiced (regrowth of broken branches). Undamaged trees are those that were not snapped, defoliated or uprooted. The number of damaged (0% to 62%), regenerated (0% to 64%), and undamaged (22% to 100%) trees per site was highly variable. There seems to be no apparent pattern or correlation with sites and the percentages of damaged, regenerated, and undamaged trees (Fig. 2). It can be inferred that due to the inherent strength of Typhoon Yolanda, all sites incurred the same level of damage. However, it was observed that different tree species show different recovery strategies (either through refoliation or seedling recruitment). The Sonneratia and Avicennia species show recovery through refoliation and regeneration of broken branches (coppicing), while Rhizophora species show recovery through seedling recruitment. Natural stands show relatively faster recovery than the planted stands. Fig. 2. Relative percentage of damaged (snapped, defoliated, undamaged), regenerated (refoliated), and undamaged trees from the total number of trees in the plots established per project site. One of the functions of mangroves is to mitigate the impacts of climate change through the reduction of greenhouse gases such as CO2. Similar to other plants, the mangrove sequesters the atmospheric CO2 and stores them in stems, branches and leaves as aboveground biomass, in roots as belowground biomass, and in soil as organic carbon. Tree heights and diameter-at-breast heights were used and served as inputs in allometric equations (per species) to estimate the above- and below-ground carbon stocks. The carbon stock in the vegetation was computed by multiplying the biomass by 50%. For soil carbon, soil cores with 100cm-depth were collected using corer and were subsampled at 1-, 2- and 5-cm depth intervals. Each subsample was dried, homogenized and analyzed to determine organic carbon content using loss on ignition (LOI) method. The amount of soil carbon was computed by multiplying the bulk density with carbon content for each sample depth. 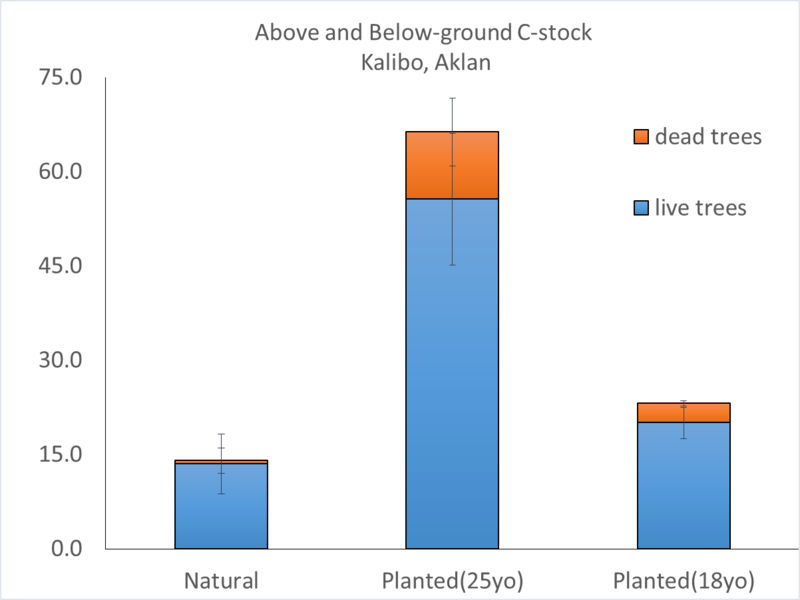 Preliminary results showed different trends in vegetation carbon stock from Aklan (Fig. 3) and Pangasinan (Fig. 4) data. Aboveground and belowground carbon stocks (AGC; BGC) were lowest in a monospecific plantation in Pangasinan, while the AGC and BGC stocks were found lowest in the natural mangrove stands of Avicennia spp. and Sonneratia spp. in Aklan. Although the natural mangroves are young (<10 yrs. ), its carbon stock contribution from vegetation was already more than half of what the 18-yr old stand had (Fig. 3). Fig. 3. Carbon stock values from mangrove park in Kalibo, Aklan. Fig. 4. Total carbon stock (aboveground, belowground, and soil) from planted mangroves in Bani, Pangasinan. Soil carbon stock made up 70-80% of the total carbon stock. The sudden decline in soil carbon stock at 10-15 cm depth suggest washout of fine organic materials, hence C-stock, which could be associated with the disturbance caused by typhoons. 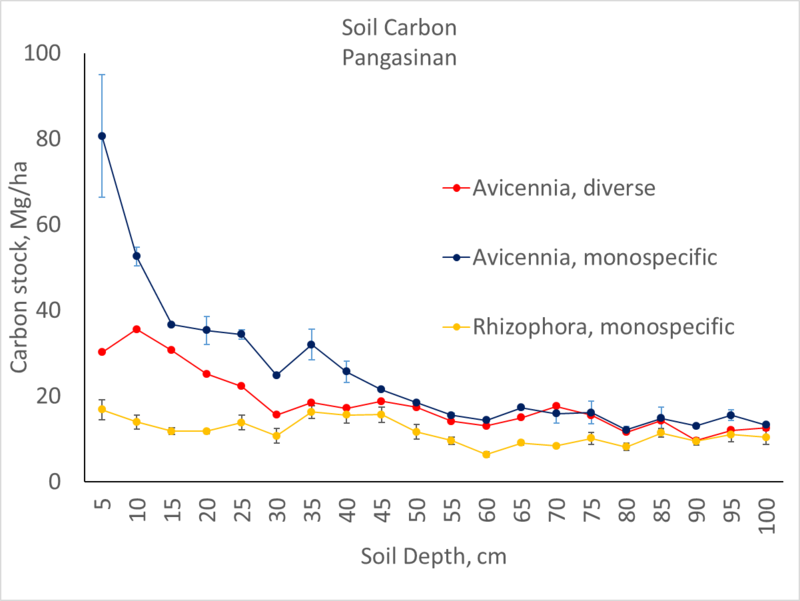 Preliminary results from Pangasinan showed the highest average soil carbon stock in monospecific natural Avicennia spp. but lowest in planted Rhizophora spp. (Fig. 5). Fig. 5. 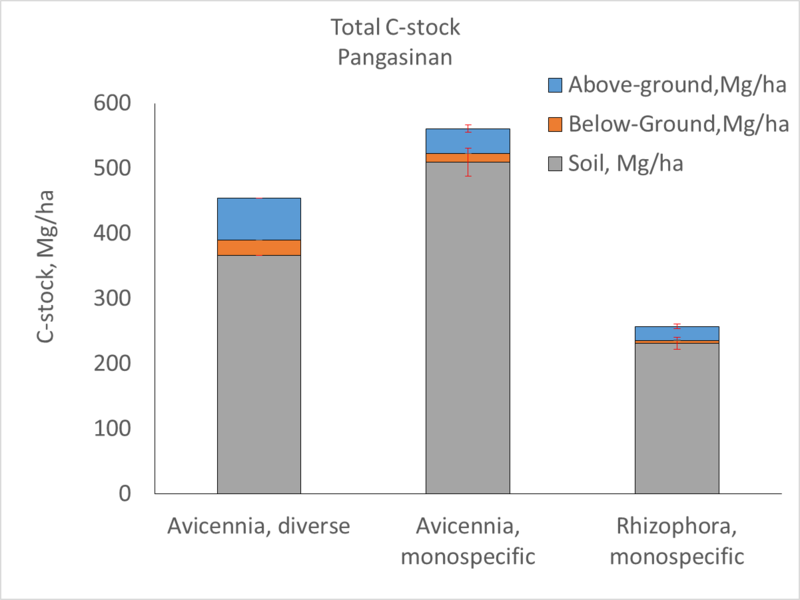 Soil carbon stock of planted mangrove stands in Bani, Pangasinan showing variation in C-values with species and with soil depth. The 210Pb analysis is used to calculate the sedimentation rate in mangroves. This technique can also be used to determine whether or not the mangrove area is coping with the projected 0.55m sea level rise at the end of the century. A 100-cm core was obtained from the site. Selected 1-cm layers were analysed for 210Pb concentration. The trend obtained from the 1-cm concentrations was used to determine the sedimentation rate. This analysis was done under a Memorandum of Agreement with the Philippine Nuclear Research Institute. Fig. 6. 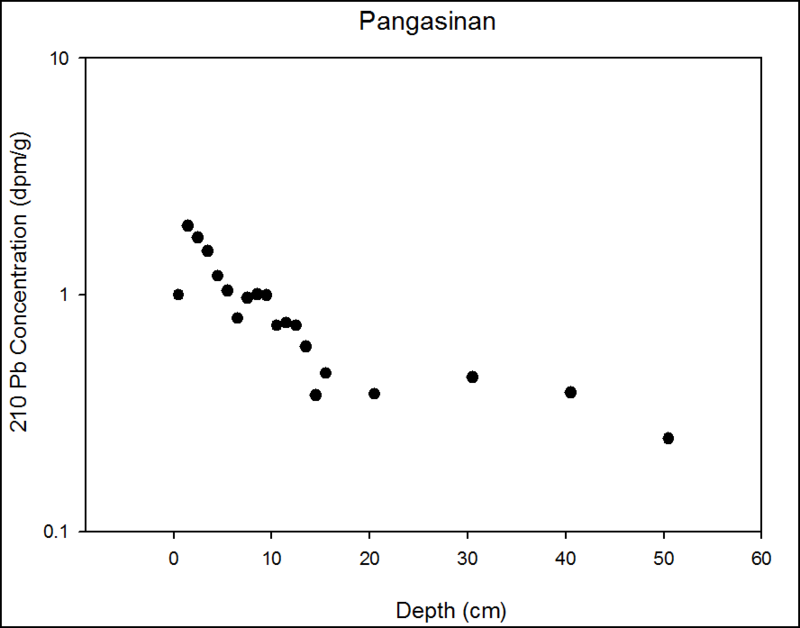 Total 210Pb concentrations of selected 1-cm layers of a core obtained from Bani, Pangasinan. Fig. 7. 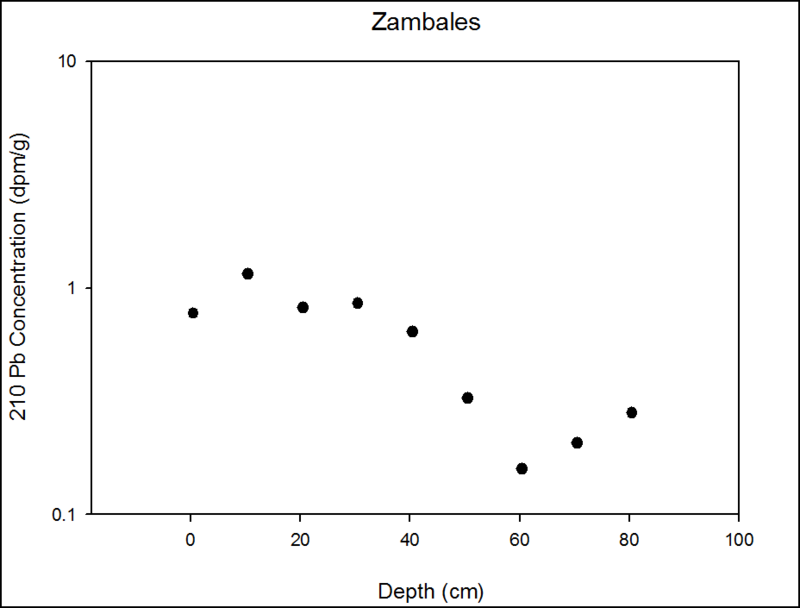 Total 210Pb concentrations of selected 1-cm layers of a core obtained from Masinloc, Zambales. Fig. 8. 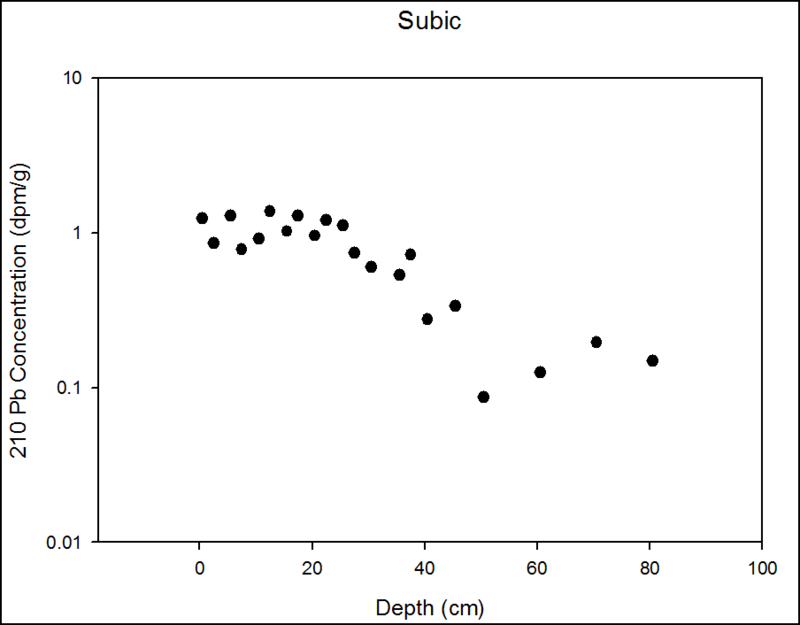 Total 210Pb concentrations of selected 1-cm layers of a core obtained from Subic Freeport Zone. Fig. 9. 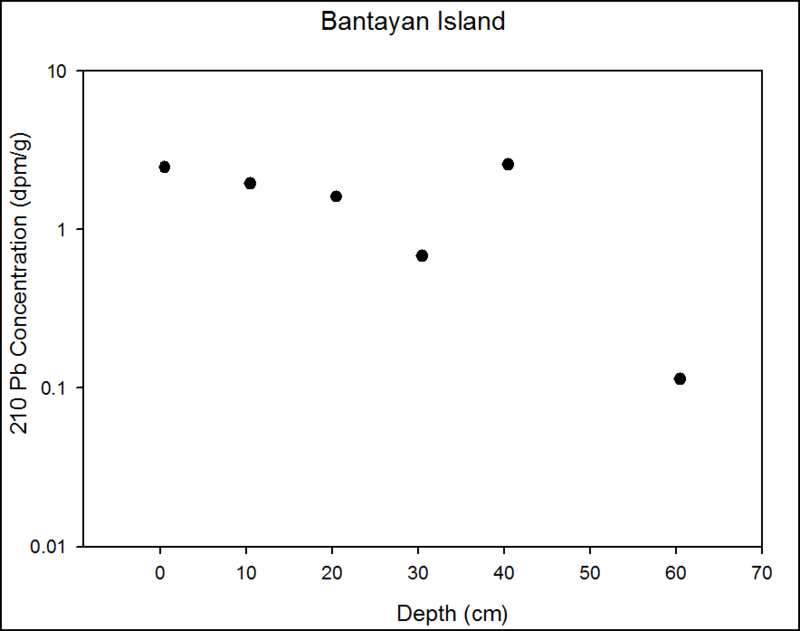 Total 210Pb concentrations of selected 1-cm layers of a core obtained from Bantayan Island, Cebu. Fig. 10. 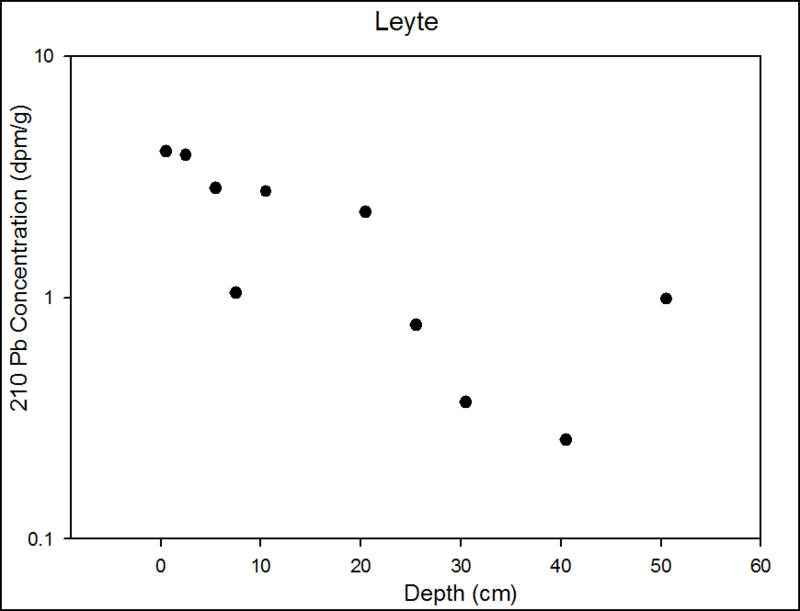 Total 210Pb concentrations of selected 1-cm layers of a core obtained from Palompon, Leyte. The project’s control sites include mangrove forests in Luzon, specifically in Masinloc (Zambales), and Subic Bay Freeport Zone. Both have significantly large areas of mangrove cover. The other site is in Bani, Pangasinan which is supported by the Asia-Pacific Network for Global Change Research (APN-GCR) project. It was damaged by Typhoon Emong in May 2009 and will serve as a good comparative site with Yolanda-damaged areas. These areas will be compared with Yolanda-damaged areas: Palompon, Leyte; Bantayan Island, Cebu; Kalibo, Aklan and Busuanga, Palawan. In Subic, mangrove forests have been protected since the time of the American colonization. Currently, 62 ha out of 65.57 ha of mangrove cover are protected areas. The Subic Bay Metropolitan Authority (SBMA) has noted that the natural mangrove forests are very diverse, and relatively free from anthropogenic activities. The local government unit of Masinloc has noted that there has been a significant decline in mangrove forest cover in their area in 2005 since 1998. Nevertheless, the government has invested in rehabilitating and reforesting their mangrove forests. The most recent data reflects that approximately 65% of Masinloc’s total mangrove cover (71.25 ha out of 109 ha) consists of secondary and planted growth. Mangrove forests in Barangay San Miguel, Bani, were considered part of a Marine Protected Area through the implementation of the Sanggunian’s Ordinance No. 1 in October 2001. Before this ordinance, around one-third of mangrove cover was lost due to human activities. Mangrove areas today cover some 615.02 ha from an area of about 990 ha in 1978. However, since the act was implemented, forest loss has been minimized. Currently, the mangrove forests of this area are thriving and denuded areas are being rehabilitated. Management strategies of the controlled sites focus on community-based management programs. Local authorities invest in alternative livelihood projects (such as mariculture), in order to prevent people from cutting down trees. All three sites also recognize the importance of public awareness, so they have education programs that introduce the significance of mangrove forests to the local community. Eco-tourism is also being held by these areas as a form of public awareness campaign, as well as an alternative source of income. Local authorities invest in strengthening their capacity to manage the forests; for example, the local government of Masinloc is currently focusing on creating a comprehensive management plan for their mangrove forests. The local authorities of all three sites also monitor and do research on their mangrove forests in order to make preservation and rehabilitation efforts more effective. Finally, these areas promote biodiversity in their forests; for instance, Subic has mangrove nurseries that cultivate indigenous mangrove species, which are eventually planted in their forests. Mangrove forests that were damaged by typhoon Haiyan in 2013 are those in the Visayas region and northern Palawan. These include Palompon in Leyte, the Bantayan Island in Cebu, Kalibo in Aklan, and Busuanga in Palawan. These areas have long coastlines, so mangrove forests comprise significant percentage of their total land area. Stakeholders from the Bantayan Islands and Kalibo were not able to make it to the meeting, so only Palompon and Coron will be discussed below. Mangroves in the damaged areas were severely affected by typhoon Haiyan in 2013. For instance, 90% of the seaward natural mangrove forests of Palompon were damaged by the typhoon. However, recovery of these forests—specifically those with Sonneratia and Avicennia species—was rapid. Palompon recorded a 95% recovery from damaged, 20 months after the typhoon. In addition, increase in the trees’ DBH, species diversity and density has been recorded in Palawan. Mangrove forest management is strong in Palompon and Palawan because the local authorities clearly understand the role of mangroves in disaster resilience. Firstly, the areas focus more on mangrove protection and preservation over forest clean-ups and planting projects. Secondly, they acknowledge the importance of species diversity in the area. Monospecific planting of Rhizophora species is being discouraged, while growth of Sonneratia and Avicennia is encouraged. Thirdly, abandoned fishponds which were former mangrove forests are being converted back into mangrove forests. Finally, both the local community and tourists are made aware of the importance of the mangroves through eco-tourism and continuing education programs.